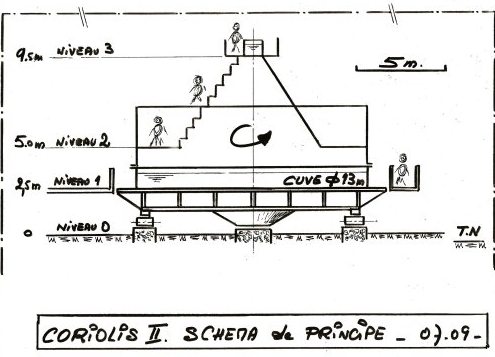 Since December 2007 we know that the Coriolis rotating platform is now set for demolition in order to allow future development of the Rue des Martyrs, which is based on 2 main projects : the extension of Line B of the tramway and the urbanism program GIANT . Since then, we are working on the rebuilding of this unique facility. We just hired Jerome Lacipiere, mechanical engineer, whos work is dedicated to the study of the new platform. Is the largest rotating platform in the world. The scientific community, especially in Europe, claims its services. This machine fits into the societal issues related to the environment. It is a wonderful training tool for scientific problems on a human scale. Reconstruction is also an exceptional opportunity to renovate and improve the mechanical elements of the instrument that suffered 50 years of constraints without interruption. Keep the main dimensions. Small change showed no obvious interest. Retain the mechanical principles which have been successful for 50 years. Use feedback to keep the good and eliminating evil. The maximum reuse of existing equipment, although it remained very limited. Under these conditions, the reconstruction can be envisaged with few delays, a total cost (building + mechanical) content, and virtually zero risk. What are the improvements ? The rotating part (roller, rail, pivot, control) has been revised. The experimental section (bearing structure and experimental vessel) will be much more functional. The portic of instrumentation will be reused with the possibility of differential rotation independent of the machine. 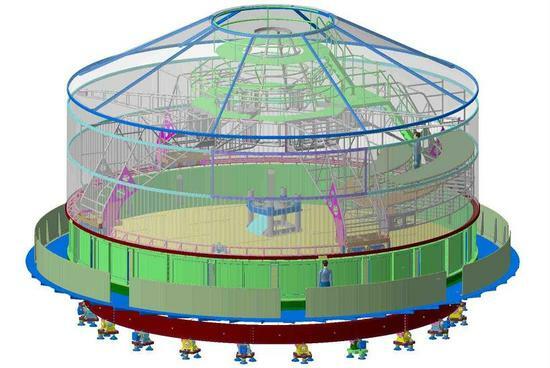 The rotating assembly will be isolated from outside air to eliminate the practice of water in the tank. The dynamic performance of the whole are revised upwards : maximum rotation down to 10s, can rotate in both directions and oscillating around 0. Security issues mainly related to the rotation has been completely redesigned. It is expected that CORIOLIS II will be installed in a new building near the LEGI on the campus of Saint Martin d’Heres. Latest forecasts indicate a start of construction of the building in March 2011 under the supervision of works of the Grenoble-INP. The experimental part could then begin in September 2011 and be completed in June 2012.